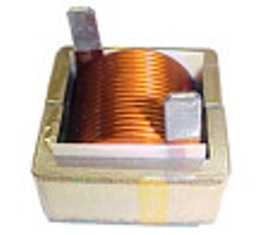 and Three Phase Amorphous Common Mode Choke (CMC). These 3 phase common mode chokes are wound on nanocrystalline and amorphous ribbon cores. Nanocrystalline and Amorphous ribbon cores are ideally suited for 50Hz to 500Hz line frequency common mode filtering. The cores are encased in high temperature plastic casing to provide mechanical integrity. Application includes installation at 50Hz or 60Hz or 400Hz 3-Phase power panels for industrial equipment, machinery, 400Hz military power generator, wind turbine power generator, DC to AC inverter, UPS, etc. 1) High permeability of 50,000 to 85,000 ui. This means less number of turns needed to achieve the same inductance, impedance and insertion loss providing better filtering solutions. 2)Very high inductance (L), impedance |Z| and insertion loss (-dB). Compared to ferrite CMC of the same size, the L can be over 4x higher at 10Khz and 2x higher at 100 Khz. Therefore smaller size can be used to achieve the same insertion loss. 3) High saturation flux density (Bm) of 1.2 Tesla or 12,000 Gauss. This means ability to withstand higher voltage spikes and higher transient noise and more effective in controlling AC Power Line conducted noise up to 10 Mhz. 4) High Curie Temperature of 570 deg C which allows it to operate at HIGHER temperature range. 5) Little variation in inductance and impedance from low temperature up to Curie temperature. This means ability to operate over a WIDER temperature range.